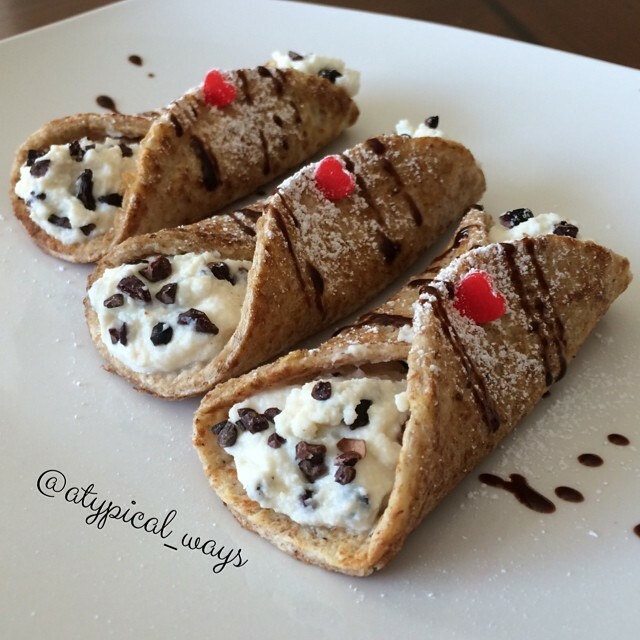 French Toast Cannoli’s – Only 295 calories for all 3! Mix together all of the filling ingredients in a small bowl and set aside. In a separate small bowl mix the egg white, milk, vanilla & cinnamon together and lightly beat with a fork. Using a rolling pin, flatten each piece of bread and cut out a circle. Dip each circle into the egg mixture and cook over medium heat for 2 or so minutes per side. Stuff each piece of toast with the filling (I secured mine with a tooth pick) and top with a little sugar free chocolate sauce & powdered sugar!